Welcome to Where Bloggers Create Blog Party. I am so glad that you stopped by. My "Painted Garden" gate is open for you to come in and sit and relax with a glass of ice tea while I share with you my creative spaces. I am a decorative modern day impressionist painter and my paintings are an expression of my love for the beauty and simplicity of God's creation. I am inspired and paint the beauty of everyday life -flower markets, roses growing on a fence, geraniums spilling over a window box, Sunflowers, lavender fields, white wicker on a porch, blue skies and blue oceans and my cottage garden. My painting career began long before I picked up a paintbrush, when I developed an eye for capturing the beauty of my garden on film by deliberately shooting out of focus to create the feel of a Monet or Renior painting. I became interested in painting after divorcing when I bought my new home and planted a smaller garden. I have traveled throughout France and fell in love with the charming small French gardens with pea gravel surfaces and went to work creating my own version in my new garden. I visited Impressionist Painter Claude Monet's garden in Giverny, France and fell in love with his garden and the way he mixed colors in his garden. I added old iron furniture picked up at Flea Markets and planted the basket of a vintage bicycle with Geraniums and Nostrum - just like Monet's garden. I designed a garden where I could create and paint. The blue bicycle has been a subject in lots of my paintings. I created different rooms in the garden so that I would have a variety of spaces to paint depending on the subject matter. The garden off my kitchen has an arbor with a red Mandavilla vine growing up it and white wicker furniture. 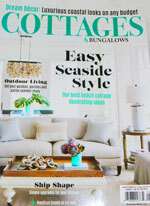 I use this area all the time for inspiration in my beach cottage paintings. Meet Bentley, my very helpful Studio Assistant. He loves being in the garden to help find inspiration for my art. I use the every day objects in my garden in my paintings such as garden hats, bird houses, vintage bicycle, pillows, etc. I love painting Sunflowers - this time of year I do not have any growing in the garden and purchase them at the farmers market for a few dollars. Looks like Bentley found some inspiration for me to paint. 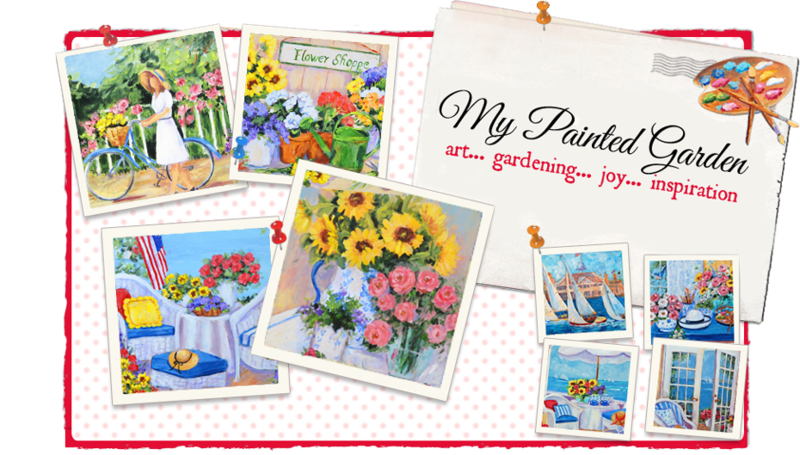 I use my little paintings to decorate my garden and call it "art in the garden". Are you ready for a cup of tea? This is one of my favorite photos of Bentley smelling the Geranium. He actually smells the flowers in my garden. 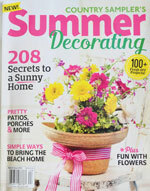 I pant seasonal flowers in pots so that I will always have them for inspiration. The Zinnias ended up in a small painting. Roses are planted in my front yard as they get sun all day. Most of them are Iceberg and they bloom profusely. The front is my English Cottage style garden with lots of pinks, rose, blue and white flowers. My side garden is behind the white gate. I also have a portion of my side garden planted in typical English Cottage style with lots of pinks, blues and whites. Let's leave my garden and go inside so I can share more places where I find inspiration and create. Would you like to take little break and sit and relax in my living room with a cup of tea? I made hot muffins for you. When I purchased my home I knew the minute I saw the red Dutch door and light filled rooms with high vaulted ceilings and French doors in the living room and kitchen that it would be the perfect home where I could create my art. I paint the beauty and simplicity of every day objects . I use my napkins and table runners in my still life paintings. I love books and seashells and they often end up in my paintings. I spend a lot time painting on the little patio off my kitchen or in my kitchen where the morning sun shines beautifully and the ocean breezes blow the blue and white check curtains. Bentley is out on the patio looking for flowers to smell. My kitchen curtains were inspired by a trip to France where I visited Monet's home and garden in Giverny. I loved the blue and white check curtains in his kitchen as well as his collection of blue and white china and was thrilled to find blue and white check curtains by Martha Stewart at the K-Mart. Fortunately I bought two sets since K-mart no longer carriers her line of linnens. I have collected blue and white china for years and have it displayed throughout my home. My collection of roosters in the kitchen along with the old blue painted furniture remind me of Provence in the South of France. You may have noticed that most of my large paintings have a piece of blue and white china - usually a vase or tea set. Blue and white china has become a signature in my large art. You will find me in my kitchen painting roosters and reminiscing of trips to Provence on sunny days when a gentle breeze is blowing from the beautiful Pacific Ocean just a few miles from my home. Now let's leave the kitchen and visit the indoor/outdoor studio in my garage. I wanted to create the feel of always painting outdoors even when the weather is bad and I have to stay inside (which is not to often in sunny Southern California). I have a very large two car garage with lots of built in storage. About ten years ago I faxu painted the garage floor by tracing flag stones on the floor with chalk and painting them with patio paint. I also used a stencil and painted brick trim around the garage - sealed it with a sealer and it has held up remarkably well. When I first started painting I met a fabulous artist, Penny Dermand , who painted beautiful flowers and roses. She gave me some great advise -"paint only what you love, and always connect with the flowers by smell, touch and feel". I follow her advise as much as possible by bringing in pots of real flowers from my garden when painting inside. I find that you can get great prices on flowers from florist or the market by asking to purchase flowers that are no longer sellable - flowers that are in full bloom - especially roses are great to paint - and usually the market starts pulling them off the shelf at their prime as they will only last a few more days. I nailed old white curtains under the storage cabinets to create space to hide messy garage things, Christmas decorations, etc. I hung a long curtain (the one behind the easel) to hide hot water heater, and used old white shutters to divide the space. Paints are stored in the white cubbard. I purchased stacking bins from Joanne's at the end of the season for around $10. each and use them to store art books and supplies. You can see a little of the brick stencil. The curtain to the left of the storage bins conceal the washer and dryer. I found a large white cabinet in the trash and use it to store mis-matched china, etc. found at flea markets that I use as props in my still life paintings. I use the white umbrella at art shows and store it in my garage studio. The old green work table was picked up at a garage sale. I white washed the inside garage doors (shown behind the unbrella) so the space woudl have the feel of an old barn. The table is used to arrange flowers for painitngs, mix paint, etc. 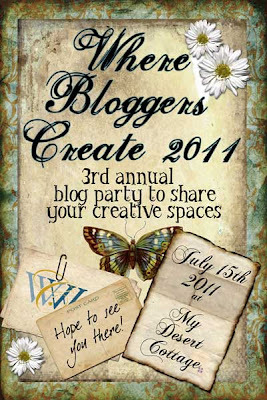 Thank you Karen of My Desert Cottage for hosting the 3rd Annual blog party where bloggers share their creative spaces. 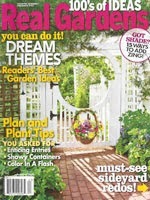 You are in for a real treat and can visist many fabulous and beautiful blogs at http://www.mydesertcottage.blogspot.com/. Thank you so much for sharing your life, art and garden. You've been an inspiration to me in creating my own garden. One day, I may even pick up a paint brush! Please keep creating and inspiring. God bless. Erin, what a treat to see where you create your beautiful art. I LOVE anything you paint but especially the red geraniums. Thanks for including the scriptures that seem so appropriate to such beauty. Thank you to share your beautiful creative spaces. It is a dream to visit them. Your painting reflects perflectly your love of color, your love for French way of living and your joie de vivre in your beautiful and charming cottage that you decorated with great taste. Of course in your kitchen I like the "wink" to Monet. 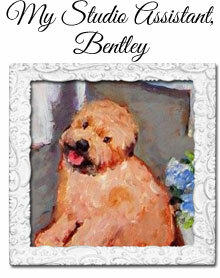 I would love to come and to paint in your lovely garden with you... and Bentley of course ! Wow...your artwork and home is beautiful, all those vivid colors sure do bring a smile to my face. What a gorgeous and inspirational work area. My senior mom would love it for her gardening as much as I would love it for fun activities for grandparents and grandchildren. And ohhh, those lovely flowers - especially the sunflowers. We've had fun the last two years growing Sunflower Houses in the back yard. Isn't it thrilling to watch them grow so big and beautiful! So, so, many things in your world I absolutely love! Sunflowers, old bike, white wicker, cottage paintings - you've got it all. What a delightful space you've created. Thank you for sharing, and inspiring. Love your gardens and the painting you have made from them. Red geraniums are the best. Thanks for sharing all the wonderful photos. I love your work. Thank you for taking time to share it with me. hi, new to your blog. Do you sell your paintings. I am IN LOVE with the bicycle one. I probably can't afford it, but it would so match my wreath on my front door...your work is fantastic. I am not much for art, sorry, but yours is definately my style!! nice to meet you! Fresh and clean! Love the geraniums...thanks so much for the lovely tour. Such a beautiful garden! No wonder it inspires you. Oh my Erin- your home is absolutely lovely- it is just what I would envision for you and sweet Bentley. Your photos are beautiful- this is a truly fabulous post- it is easy to see where your amazing inspirations come from. I have always wanted a little tour of your home- this was such a thrill! My goodness, Erin, your home and gardens are just gorgeous! You have created such a beautiful environment in which to create. I am blown away by all the beauty. Thank you so much for sharing it with us. As always just beautiful. You are surrounded by such a site you must be inspired. Love to visit your blog to see what is blooming. Wow! 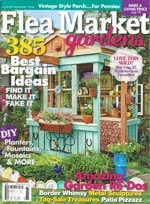 I LOVE your garden, patio, kitchen, studio, ALL of it :) Your space seems so welcoming. Your paintings are beautiful, you have a great talent! :) Thank you for sharing your spaces with us! I always love seeing your beautiful garden Erin and all the inspirations for your lovely paintings. wow ... I love your garden! So full of color! thank you for sharing! What a happy, cheer, bright, fun, and delightful your creative world is! I am floored by your creativity. I love that you paint inside and outside. Your work both in the gardens and your carefully arranged home is phenomenal!!! Stunning all the way through. I would love to see it in real life. Oh, how lovely! I can stay on your site for hours! God bless you and your creative soul. I enjoyed every photo and presentation. I'm a florist (for 21 years now) so I'm always drawn to flowers. But my blog is more of my other love~ creating crafts and things repurposed, and sometime baking. I'll probably start a new blog for my flower shop. Hope you'll have a chance to drop by my humble space. I am new to your beautiful blog and I am so glad that I stopped by. What a feast for the eyes this post was! Your garden is spectacular . No wonder it gives you such inspiration for painting the magnificent pictures that you do! Your art is amazing and you are so talented. I signed up to follow because I am looking forward to seeing more!! I love all your bright, cheeful colors both inside and out. It is just a sunny day! Your paintings are full of joy! Wow, I could spend days in your studio admiring all your paintings and art. Your garden is beautiful and I love everything about your charming area. Thanks for sharing. That was a fun tour! Your art is beautiful! Thank you for sharing! Enjoyed seeing your beautiful garden and home. You have truly creative spaces to work in. Your painting are just lovely! Thank you for stopping by, now I've found your delightful blog. I'm a new follower. Thank you so much for all your blessing to us and sharing your beautiful cottageand the most beutiful garden, I love all your paint. Erin, I know I have told you that I love your paintings before. But I also love your garden patio where you find so much inspiration. I sure would like to sit there and have a drink of that iced tea. And your blue and white kitchen... LOVE it! So bright and cheerful! 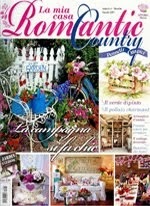 Your garden, your home and your sturdio in your garage are just beatiful and I am sure that they are very inspiring. Your artwork is also very beautiful. I love your blue and white throughout your home. Thanks so much for sharing your lovely space with us. I just love everything about your wonderful colorful world!! I too love blue!!! Thank you for sharing your amazing talent and creative spaces!!!! I so hope you will drop by and see my little craft cottage!! Thank you for a tour of your beautiful garden and home. I will have to come and visit again, such beauty and sense of tranquillity. Both your garden and your interior spaces are SO lovely!! Your gardens, your home and your artwork is just amazing! I've enjoyed myself tremendously just having a peek into your lovely space. Your haven that you've created just takes my breathe away. Thanks so much for sharing your garden vignettes, your home, your lovely art and photography. Erin I had the best time visiting you!! Thank you so much for all the wonderful photos! Your Wheaton Bentley is the cutest thing ever!!! You garden is spectacular and I love your artwork. Thank you so much for participating in this years event!! I hope you had a wonderful time!! I love your garden. Love your paintings. What a lovely place.